The TS 4 mezzanine consists of a metal mezzanine suitable for maximising small space with high ceilings, maintaining the stability and robustness of Tecrostar tailored mezzanines. With a surface area of 4 m² and a load bearing capacity of up to 700 kg, it easily converts any room into two, in both business and homes. Without bricklaying, without needing to be a DIY expert and without construction work. The TS 4 metal mezzanine can be adjusted to various heights to get the effect of a tailored mezzanine. 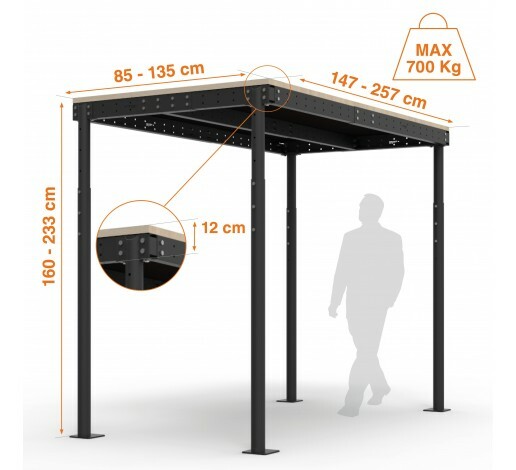 Habituée des produits Tecro depuis des années, j'ai été ravie de trouver une mezzanine "spéciale petits espaces". La qualité et le design sont toujours au rendez-vous! Et le service client est réactif et efficace. Bravo!